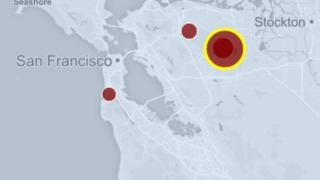 A 3.8-magnitude earthquake rattled the East Bay Saturday evening, according to the USGS. Preliminary reports indicate that the earthquake struck at 6:29 p.m. roughly eight miles southwest of Brentwood, seven miles northeast of Blackhawk and 34 miles east of San Francisco, according to the USGS. Witnesses reported feeling the earthquake in East Bay cities such as San Ramon, Brentwood, Pleasanton and Pittsburg. Others also reportedly felt shaking in Tracy and Stockton. To keep track of earthquakes across the Bay Area in real time, keep an eye on NBC Bay Area's earthquake map.